12 cubic feet of red cedar mulch neatly stacked inside the trunk. We did not want to get the insides dirty and so the back seats are not folded, so it shows the actual trunk capacity. In fact, another 3 cu. ft bag would fit behind the stack but we had some other gardening stuff taking that place already. In addition, yet another one would fit on top of the stack but I was afraid it would slide forward onto the back seats should I stop too hard. So, figure you have about 18 cubic ft. of useable space in your trunk. Toyota advertises 14.4 cubic ft of trunk capacity. Of course we would always recommend to put some sort of a tarp or a rug so the trunk itself is kept clean. By the way, the aluminum bar that goes across the back of the trunk and houses the rolled up trunk curtain is very useful in tucking the tarp and holding it firmly in place. Or, and that stuff that my wife Tanya helps me unroll is lawn edger made of shredded recycled tires. Neat stuff, very pliable and environment – friendly of course. This entry was posted on Thursday, June 7th, 2007 at 1:44 pm	and is filed under Toyota Prius. You can follow any responses to this entry through the RSS 2.0 feed. You can leave a response, or trackback from your own site. I don’t usually do THIS stuff which is why having a truck to haul mulch once a year would be just silly. What I DO do – driving a lot – Prius excels at. 1) that car is all form, no substance: its environmental impact is far greater than other small, efficient cars. It takes more energy to build and maintain a Prius than a Grand Cherokee. Buy a smart car or a Ford Focus. b) again, more environmentally wasteful in the individual wrapped package. Buy bulk, have it delivered, move it in a wheel barrow. If you drive 2000 miles a week like me the Prius will save you a lot of money at the pump. 50 miles per gallon combined mileage. I traded in an2005 Impala that was getting 29 on the highway. I ‘m saving enough pay for the monthly payment on a new 2011 Prius. Hi. I was looking for photos of Priuses and yours was perfect for this story, so I grabbed it. Let me know if you’d rather I not use it and I’ll remove it immediately. I gave credit to this blog and linked to it, of course. 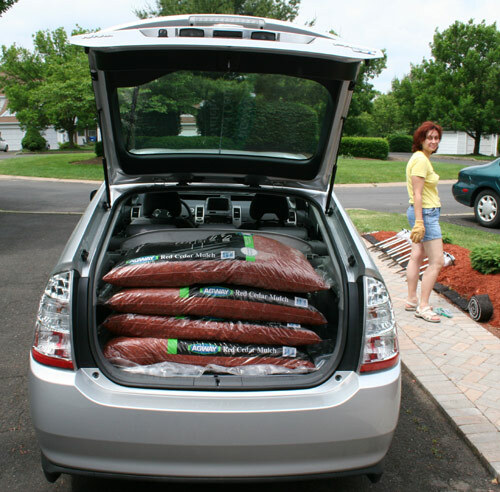 Also, see the story linked to within this link – the GardenRant article about cars for hauling stuff – several happy Prius customers! Sure, why not? Glad you could use it and thanks for the link! Cheers!